My name is Fr. Jason Wooleyhan, TOR, I was ordained a priest on Saturday, June 10. A little bit about myself: I grew up in Pittsburgh, PA, going to Catholic grade school and public high school. I double-majored in Mathematics and Statistics, with a minor in Business, at Penn State University (main campus), where I eventually became involved with various Christian groups and the Catholic campus ministry. After I graduated, I worked for the Department of Defense in Washington, DC, for two years as an analyst, where I met the seminarian friars at Catholic University. I entered as a Postulant in August 2010 at age 24. My parents are devout Catholics, and I have one younger brother who is almost 20 years old (yes, 11 years younger than myself). They all moved to northern Virginia about 13 years ago--so Virginia is like a second home for me. I always ask people to keep them in prayer, so God will continuously bless them as He already has. My ministry experience leading up to this has primarily included: campus ministry, hospital and nursing home ministry, teaching elementary school religion, and music ministry. 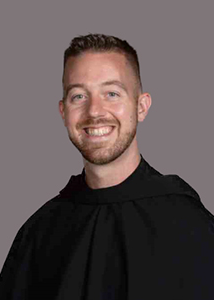 My last full-time ministry position was Pastoral Associate for Evangelization at Franciscan University in Steubenville, OH, which included leading praise & worship ministries, men's ministry, a youth ministry mission trip to San Diego, and dorm chaplaincy. I love music. I play piano, some guitar, and continuously am learning organ. I love to listen to music--all kinds of music (from rock to electronic to symphony orchestra)--and going to an occasional concert when I can. During seminary, I took numerous 1-credit courses in music for my own enrichment. I also like weight-lifting, running, and exercise--so if anyone can recommend a local gym, please let me know! I also love people--so please, take time to introduce yourself to me at some point, and tell me a little about yourself.